te'-man (teman, "on the right," i.e. "south"; Thaiman): The name of a district and town in the land of Edom, named after Teman the grandson of Esau, the son of his firstborn, Eliphaz (Genesis 36:11 1 Chronicles 1:36). A duke Teman is named among the chiefs or clans of Edom (Genesis 36:42 1 Chronicles 1:53). He does not however appear first, in the place of the firstborn. Husham of the land of the Temanites was one of the ancient kings of Edom (Genesis 36:34 1 Chronicles 1:45). From Obad 1:9 we gather that Teman was in the land of Esau (Edom). In Amos 1:12 it is named along with Bozrah, the capital of Edom. In Ezekiel 25:13 desolation is denounced upon Edom: "From Teman even unto Dedan shall they fall by the sword." Dedan being in the South, Teman must be sought in the North Eusebius, Onomasticon knows a district in the Gebalene region called Theman, and also a town with the same name, occupied by a Roman garrison, 15 miles from Petra. Unfortunately no indication of direction is given. No trace of the name has yet been found. It may have been on the road from Elath to Bozrah. The inhabitants of Teman seem to have been famous for their wisdom (Jeremiah 49:7 Obadiah 1:8 f). Eliphaz the Temanite was chief of the comforters of Job (2:11, etc.). The manner in which the city is mentioned by the prophets, now by itself, and again as standing for Edom, shows how important it must have been in their time. 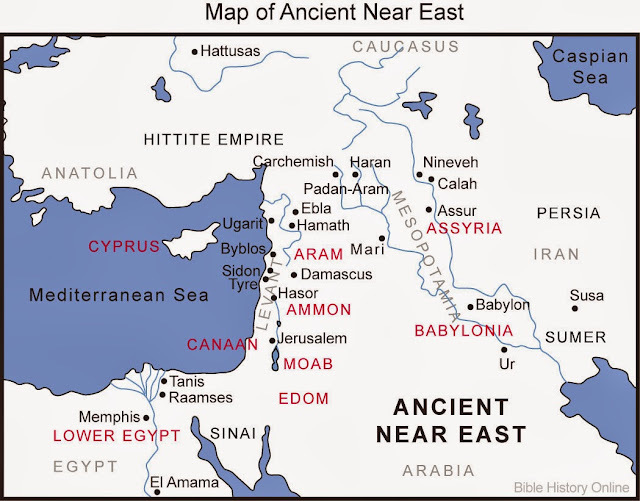 The ancient kingdom of Edom, sometimes identified with Uz, is approximately the darkened area.The Land of Uz (Hebrew: ארץ עוץ‎) is a place mentioned in the Old Testament, most prominently in the Book of Job, which begins, "There was a man in the land of Uz, whose name was Job". The word may also be related etymologically to the word oz, meaning 'east'. In the Book of Job (1:3), Job is described as "the greatest of all the people of the East." edit]Uz is sometimes identified with the kingdom of Edom, roughly in the area of modern-day southwestern Jordan and southern Israel. Lamentations 4:21 reads: "Rejoice and be glad, O daughter of Edom, that dwellest in the land of Uz". Other locations proposed for Uz include more southern Arabia, especially Dhofar, said to be the home of the original Arabs; Bashan in modern-day southern Syria/western Jordan; Arabia east of Petra, Jordan; and even modern-day Uzbekistan. According to the Dead Sea document, The War Scroll, the land of Uz is mentioned as existing somewhere beyond the Euphrates possibly in relation to Aram. In Column 2 verse 11, it is noted, "they shall fight against the rest of the sons of Aramea: Uz, Hul, Togar, and Mesha, who are beyond the Euphrates." edit]The Israeli author and translator Yemima Avidar-Tchernovitz, the first to translate Frank Baum's "The Wizard of Oz" to Hebrew, used "Land of Uz" as the Hebrew translation of Baum's "Land of Oz". Jesus is The Good Shepherd. Who am I?